A while back one of my sisters told my mother and me that God told her things. And, I still question those to this day. Why am I questioning them, because what she told me and my mother just didn’t really hit me in a way that I knew it was from God. Let me explain, there for awhile I felt like God was talking to me about my family and about myself, as I felt like the Lord was talking to me and I was writing it down, I felt as if He wanted me to tell those He wanted to know, what I felt like He wanted me to tell. One person I read this to was of course my mother, I read her a few of them. Well, my mother told my oldest sister, that of what I felt the Lord told me, or actually what I felt was happening. The next thing I knew my oldest sister was saying God spoke to her, I am not saying He didn’t because none of us know when or what God tells someone, but she said she felt God tell her something about my mother and I! Now, I remind you I am not saying God didn’t speak to her, but I do question this, and the Bible tells us to test the spirits and this is what I was trying to do. Now, again I’m not saying, she’s lying or anything, but usually when someone prophecies over you, you usually can feel the connection. The message that they may be getting, just might be for themselves only and not for someone else. Reason why I feel this way, #1 I just do not feel in my heart God will tell someone not to carry someone to church, or go to their church, and my mother wanted to go to their church, I am still having a hard time understanding this, because I was always brought up to know that when someone wants to go to church with you we are to carry them, not refuse or tell them we couldn’t. And #2, my mother is a God Fearing Christian woman, and she wanted so much to go to their church, she used to be Catholic before her and my daddy got married, and she wanted to go so bad. And, I am sure God placed that on my mother's heart, otherwise she wouldn't have felt like she needed to go, or wanted to go. I did this paper before my sister passed away(2012), she passed this June 19th 2014 and now I really don’t think I should’ve questioned this. And, forgive me Father if I wasn’t supposed to have. Sometimes, God will, He will work through other people and work through our dreams, but sometimes our dreams can be talking to us personally and people we know may be in them or someone else that represents them, but it doesn’t mean they are about those certain people. The dreams could be about ourselves, and changes we need to make in our lives or how we need to act or treat other’s, God is trying to tell us something through our dreams, something we need to fix in our own lives or, yes it could be a message for someone else, and we do need to let them know. Example : I had this dream where we was renovating this house off Mt Meigs Rd Montgomery, Al. We never lived there, never been inside that house before, but one day my husband and I was out together and for some odd reason he went down Mt Meigs Rd, all the sudden, I seen the two houses which was in my dream in reality. One was on the right side and yep the other was on the left across the street 2 house down , I said loudly “There’s those two houses I seen in my dream.” My husband said what house? Let’s see, it was me, our friend Mike, my sister Debbie the one that passed away, and a few other people I am not sure who they were across the hall. I was squatting down in the floor in the next room ,trying to undo this useless pipe and I was struggling with it, in the mean time I was banging on it to loosen it up, to make a long dream short, the pipe exploded but, I was fine –– I seen my head jerking side to side in the explosion, but I was fine, but everyone else wasn’t. Now, a few days later, my oldest sister started something really bad and our relationship blew up. Yes I did say blew up! But, what else could my dream mean? I do not know, but our dreams are always trying to help us in circumstances in our lives, like giving us a warning of some kind, if we pay attention to our dreams we may find a way through our circumstances and try to make our lives better or for other’s. But, just because you have a prophetic word or dream it doesn’t necessarily mean it’s for other people, it may just be for something that is going on in you or your life. 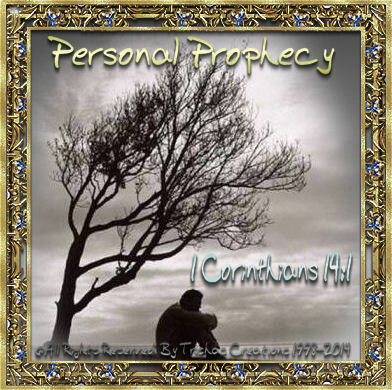 Read 1 Corinthians 14:1,3,4 will help all of us understand prophecy! Prophetic word, must be in the line with God, His word, the prophetic word you hear should and will line up with God’s Word, like when my sister told me what she did I just knew in my heart that not all what she was telling me was all lining up. God would NOT tell anyone, by my feelings not to carry someone to church which is wanting to go to their church. God doesn’t care what Church we go to, He will however lead you to the Church He wants you to go, but He will not tell you not to carry someone to church. God , doesn’t care where we go, as long as they Preach the Word of God and it’s truth and that they believe in the Son of God and that He shed his blood and he died and rose again…..
We will know in our hearts if the prophetic word lines up in our hearts with the word of God. If it doesn’t I do my best to ignore it, even though sometimes I am bothered by certain things, because My God doesn’t refuse people to go to church. I’m not saying Prophetic Words are not true, no way….. I am saying what I was told surely didn’t line up we are to test the spirits and I was and I am glad I did because what I was being told just didn’t add up to me and matching up with what I knew God wouldn’t tell anyone. Correct me if, I am thinking wrong, but I really do not think I am. If, the Prophetic word, doesn't NOT bear witness to you and in your heart, just don’t worry about it. What was told to me did for a long time, but God helped me, not worry about it because it didn’t line up with God’s Character. There are people who think they hear from God, but do they really, don’t and what they may be seeing in a dream or being told is about them or no one else. Always use Caution! Somewhere along the way, God will reveal to you whether the prophetic word which someone told you, whether it was from Him or not, He will let you know, He will tell you ! If, some Prophesies are in your heart, then give God Praise for them when you hear them, but if they are not already there in your heart, write what you were told down, and wait. If, a prophetic word was spoken over you, and it is truly God, He will make sure it happens in His Own time. When we have a clear reception about what was spoken over us we will have a clear direction. We will need Him to fulfill the promises without trying to be manipulative in their manifestations. When the prophetic promise comes, the Holy Spirit will help us remember the prophetic word that was told to us over our life. It’s pray fully Godly believers have spoken a Good word of prophecy over you, then it’s a great sign that their prophetic word is from God. Satan will try to use other’s and his attacks to try to bring the word down which was prophesied over you, but you again have to bind satan. We have to be steadfast in faith, trust and believe ,test the spirits because not all people have heard from God!